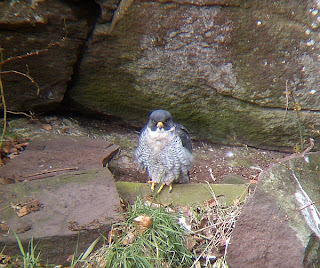 The Peregrine have arrived back at New Lanark to breed for another year. The cold weather has set them back a little, but both the male and female were about for long periods today. 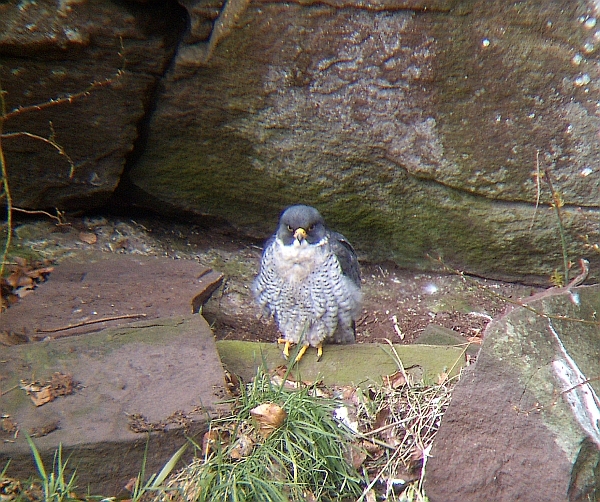 Peregrine have been nesting at New Lanark since the 1990's. Peregrine are crow-sized falcon with a blue-grey back, barred white underparts, and a black head and "moustache". Females are much larger than males. The Peregrine is renowned for its speed, reaching over 200mph during its high speed dive and is fastest member of the animal kingdom. 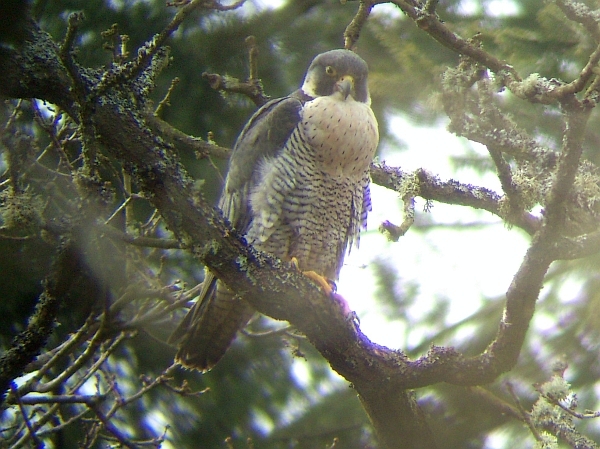 The Peregrine diet consists almost exclusively of medium-sized birds, but it will occasionally hunt small mammals, small reptiles, or even insects. It reaches sexual maturity at one year and mates for life. The nest is normally on a scrape on cliff edges or on tall human-made structures. 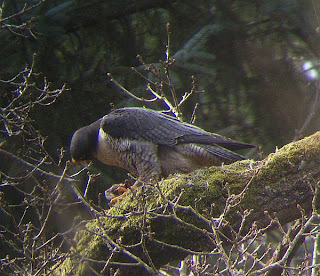 I managed to get some photographs of these beautiful birds while at the hide in New Lanark. It is hoped that they will lay some eggs in the next week or so. The viewing area is open everyday for visitors to observe the birds.The Scottish Wildlife Trust manage the area where the birds are nesting and the site is protected on a 24 hour basis. Scottish Wildlife Trust Visitor Centre is open every day from 10am to 4pm. Non-members are asked to donate 3.00 GBP. The Visitor Centre is located in New Lanark, just 30 miles south-east of Glasgow and 35 miles south-west of Edinburgh.